See the large clear display of temperature and relative humidity. Both important for comfort and health. VERDICT: I like it. It's accurate and easy to read. We improved the air-tightness of our house to save energy. But then we had a problem in winter with humidity. Local councillors tell me that when they get complaints about 'damp' it's often condensation from poor ventilation. Homes that are cheaper to heat need new routines. And new tools to help us run them well. 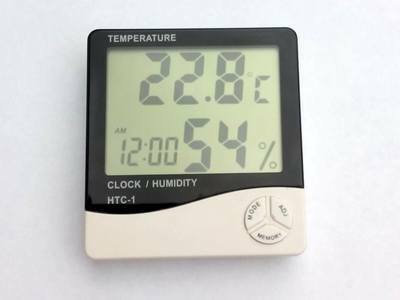 This desktop humidity and temperature meter works well. It can be read across a room. It is good value for money. Thermometers are easy to come by and cheap. Most of us have thermostats. Humidity meters are much thinner on the ground! The MHRV (Mechanical Heat-Recovery Ventilation) in our bathroom increases ventilation while retaining heat. It has a humidity sensor. The fan automatically goes into boost mode when humidity is high. This happens during a shower or bath. So I have one device to help crudely manage humidity. It is not enough on its own. My only humidity sensor with a readout was a piece of test equipment, a Maplin N09AQ 4-in-1 Multi-Function Environment Meter. It was expensive at ~£70. It does not have a continuous display. 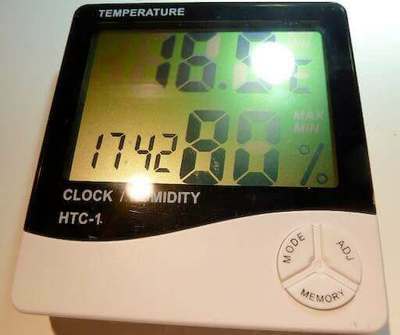 Also, humidity sensors seem to work best if allowed to 'settle' for as much as an hour. Making measurements all around the house at the same time is difficult with one meter! The HTC-1 seems well built. It also looks nice. I aim to keep relative humidity below 70%. If a meter shows more, I try raising ventilation where practical. (For example, I open a window when it's not too cold out.) Or I can wheel out our portable dehumdifier. That is useful in the kitchen when drying clothes. This meter helps us spot issues and fix them easily. We don't have to just guess! We've seen persistent high readings. We know that we probably need more ventilation. Maybe another fan of similar size per person, in fact. So we're adding another MHRV in the kitchen. Moisture in the house should then be removed quickly. Heat: both to evaporate moisture and increase the capacity of the air to hold moisture. This means that the cold air outside (wintertime) usually holds less absolute moisture than the warm air in your house so when it's brought inside and it mixes with the warm house air, it warms and the relative humidity inside falls. There's a common mistake made when people open the windows and turn the heating off and expect it to dry out. Find and remediate particularly cold surfaces, thermal bridges, poor insulation, blown windows etc. Radiators under Windows in older properties (and on) are usually a good idea to ensure there's not a particularly cold surface that warm moist air will find & condensate on. Plus it aids in mixing air and preventing drafts. On modern or well renovated properties such as Damons this isn't as critical. Locate and remediate any sources of water ingress such as damaged waterproofing, dodgy gutters etc. 2017/12/08: See Garreth Tinsley's comment on LinkedIn. At Amazon £3.98 at 2012/11/13: many thanks to Martin F for spotting it! Maplin N09AQ 4-in-1 Multi-Function Environment Meter, £69.99 at 2012/11/13. First published 2008-03-03 , updated 2019-04-22 , rebuilt 2019-04-23 . Site copyright © 2007-2019 Damon Hart-Davis. Hosted by ExNet.